This week I am reflecting on weight loss numbers. How many of us focus on the huge numbers? How often does that lead to us despairing and heading for an unhealthy snack or three? We start our weight loss journeys with high hopes and then the big figures (no pun intended!) get to us and we give up. We need to have a word with ourselves. 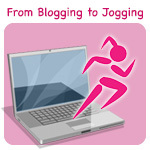 Welcome to the Blogging to Jogging linky. Great tips. I have to admit I have found that thinking about how far I have still to go stops me in my tracks and makes me want to give up. Seeing those huge numbers makes it all seem impossible, but you’re right, we can do this! We are all the same. I have to be honest though, I much prefer to work in lb’s rather than stone. I think my reasoning is that I can watch the number coming down each week. Whereas it could take a few weeks to reduce the number of stones.